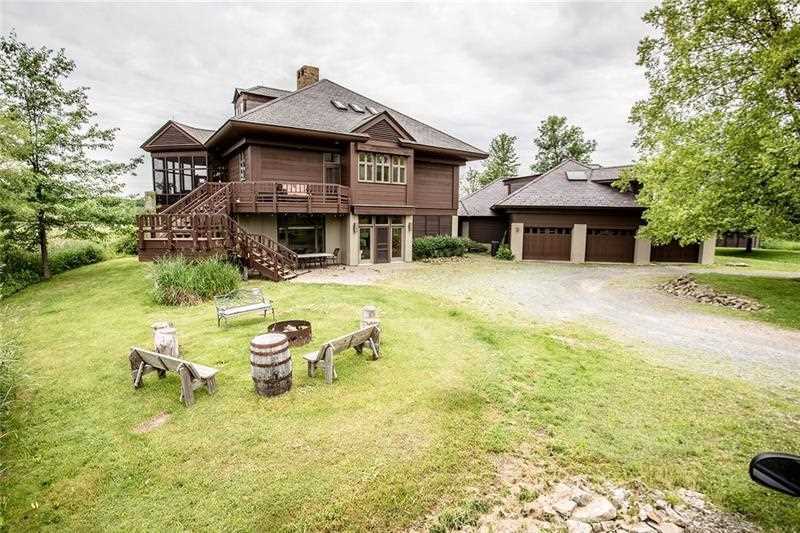 Nature Lover's Paradise best describes this 100 acre retreat - perfect for hunting, fishing, watching wildlife, horseback riding/training, kayaking, quad riding, and nature walks. Acreage is a combination of woodlands, pastures, ponds, trails, and marsh. The spacious Amish built home has an open floor plan with so many unique and custom amenities: huge stone fireplace with built-in cabinets, screened in deck area, multiple outdoor sitting areas, floor to ceiling windows allow plenty of sunshine to enter the home, and finished game room with custom hunting gear closet. Separate entrance/quarters for guests or staff has a living area, bedroom, full bath and full kitchen. Ideal year round residence about 1 hour north of Pittsburgh. Close to Highway Access and Grove City Outlets. Directions: Do Not Use GPS - I79 North Right Exit #121 Turn Right on Rt 62 drive about 3 miles past red barn. Make a right onto Bestwick. Road winds around about 1 mile. Turn right into property at mailbox. Listing provided courtesy of RE/MAX Select Realty. I was searching for a Property and found this listing (MLS #1343980). I would like to schedule a showing for 97 Bestwick Rd Jackson Center, PA 16133. Thank you! I was searching for a Property and found this listing (MLS #1343980). Please send me more information regarding 97 Bestwick Rd Jackson Center, PA 16133. Thank you! The content relating to real estate for sale on this web site comes in part from the IDX program of West Penn Multi-List, Inc. Real estate listings held by brokerage firms other than Clear Choice Enterprises are marked with the West Penn logo, and detailed information about these properties includes the names of the listing brokers. Listing content is copyright © 2019 West Penn Multi-List, Inc. This content last updated on 4/19/2019. Some properties which appear for sale on this site may subsequently have sold or may no longer be available. All information provided is deemed reliable but is not guaranteed and should be independently verified. IDX and listing information is provided exclusively for consumers' personal, non-commercial use and may not be used for any purpose other than to identify prospective properties consumers may be interested in purchasing. MLS # 1343980: This property at 97 Bestwick Rd, Jackson Center, PA 16133 is located in the subdivision and is listed for $950,000. MLS # 1343980 has been on the market for 305 days.